One of the questions I’ve often been asked is – how autobiographical is The Scandalous Life of Sasha Torte? Given that Sasha Torte is sabotaged by abusive and neglectful parenting, escalating depression and a later addiction to opium, laudanum, champagne, piratical men and hard liquor, the question becomes loaded and decidedly bizarre. Edward St Aubyn has written five novels about the fictional Melrose family. In the final novel, At Last, Patrick Melrose struggles to comes to terms with his damaged relationship with his parents and the gothic brutality of his upbringing. The traumatic events that occurred in the Melrose family home can be a hard read at times, because they are predominately crimes against women and children. However, Patrick’s childhood abuse does help the reader understand his later self-destructive behaviour. Edward St Aubyn’s personal connection to his material has been discussed in some book reviews. But asking outright if St Aubyn’s family is as narcissistic, dysfunctional or as sadomasochistic as the Melrose Family, is not something most journalists choose to address. Although one reviewer did manage to conclude that St Aubyn’s family can’t have been all that bad – given that St Aubyn dedicated one of his novels to his mother. As brilliantly played by Benedict Cumberbatch in the television series, Patrick Melrose, Patrick is a member of the financially distressed British aristocracy. He’s a witty intellectual, an observer with a satirical bent and he has the ability to see through adult hypocrisies. Having survived a gothic childhood of extreme emotional and sexual abuse he’s also acquired a few bad habits – namely alcohol, cocaine, Quaaludes and heroin. As Dr Drew Pinsky – a professional addictionologist – pointed out in a recent interview (IndieWire, June 2018), Patrick Melrose had a psychopath for a father and an alcoholic mother who not only failed protect her son but then abandoned him. However, St Aubyn wasn’t just writing about dysfunctional families and addiction in the Melrose novels. He also analyses the British class system and the way humans struggle to relate to each other. His cutting wit dissects both the established aristocracy and the newly rich. The writing is disturbing and dark but frequently it’s also comedic. And even though I think St Aubyn’s fictional children are unreal, immensely irritating and way too knowing for their age, I find his Melrose family novels engaging, fiercely satirical, brilliantly humorous and quite moving. 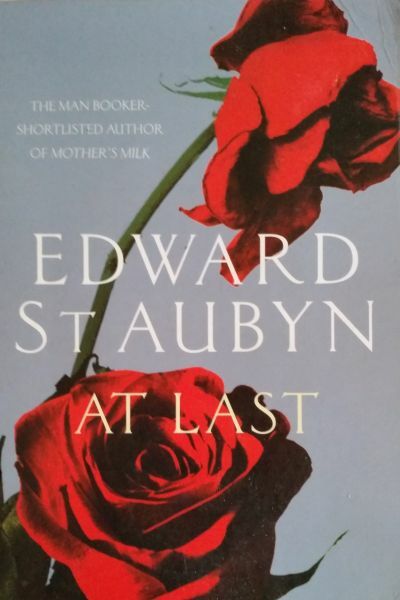 Photograph: Book Cover from At Last by Edward St Aubyn. Published by Picador 2011.